Beattie, Scott. « Height vs. Depth in Badging Framework Design ». Dans Foundation of Digital Badges and Micro-Credentials. Sous la direction de Dirk Ifenthaler, Nicole Bellin-Mularski et Dana-Kristin Mah, 307‑24. Springer International Publishing, 2016. doi:10.1007/978-3-319-15425-1_17. 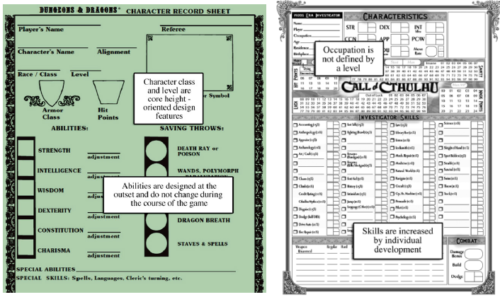 D&D was the first game to include a permanent portfolio following the player character through different sessions of play. This portfolio is represented by the character sheet. It lists and quantifies the abilities of the character and it follows his evolution through time. D&D system is height-oriented (with class level as main measure) whereas the Basic Roleplaying system is depth-oriented (with differents skills evolving separately). To design efficient badging educational frameworks, the character sheet can be an artefact that help structuring the numerous badges collected by the learners. A heigh-based system is more simple, motivating, based on competition and can satisfy new learners. A depth-based system is more complex to design but it can satisfy learners less motivated by competition and more motivated by collecting and curating achievements. The 2 systems are not exclusive and can be combined.